Notation is needed for chess tournament play but it can be a painful process. Pitfalls include forgetting moves, running out of room on your paper score sheet, and the possibility of notating the incorrect moves over and over again. Electronic chess notation is available, however all of the devices on the market are antiquated and a stylus is required to use them. Also, consumers are currently unable to order a device since they are all either backordered or no longer in production. ChessNoteR, the future of chess notation, is a new and robust solution breaking into the market for electronic chess notation. We considered all the problems of each electronic chess notation device on the market and took a new clear-minded approach to remove the complexity from the software and bring ease-of-use to the hardware. The result is a well-developed and simplistic application that can be used via a touch screen device that easily notates chess. ChessNoteR is the future of chess notation! The best notation solution, period. Just touch the screen, input the tournament data, add the opponent information, and play. No stylus necessary. 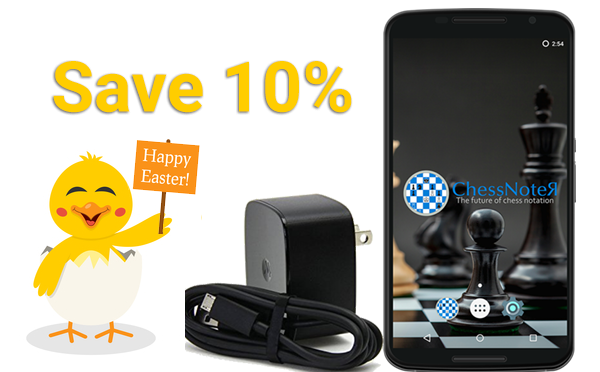 The device is running a custom built Android operating system (the most popular mobile operating system on the planet) coupled with a specialized chess notation application. Not only does this system create PGN files which can be used with ChessBase, Fritz or other systems, it also has a signable PDF score sheet for each round played. Simply connect a Micro USB cable to the device and the Tournament Director’s computer and copy both files. A future of tournaments that are 100% paperless are now within reach! From the ground up we have developed a completely closed and secure operating system. We have also configured updates to be received through the device’s Wi-Fi using an SSH2 secure shell connection to our servers. Rest assured, all updates are securely downloaded and installed and cannot be reverse engineered. ChessNoteR has been officially certified by the US Chess Federation as of December 18, 2017! The device is built by Motorola and designed by Google, two brands that are trusted by millions. Once we reload the operating system it’s a notation dream! Our supported devices offer 32GB or 64GB. Other devices offer only 4MB to 2GB. As we continue forward with the development of our ecosystem, software updates will be free!